In just two weeks, I set out again for missionary work in Kenya. Nearly four months have passed since I was last there. Regardless of having witnessed the deep suffering of others, it can be common — effortless really — for the “good life” of the United States to lull one back into numb complacency. 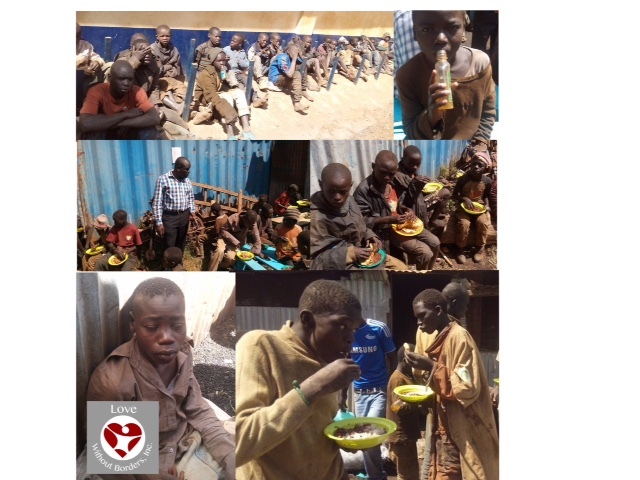 While I’m grateful this has not happened to me, being away from the front lines of Kitale has made it easier for my heart to disconnect from the depths of discontent and utter grief I felt when ministering to the homeless orphans there. But then, new images of the work we are doing there arrive — like today — and my heart again weeps. Thank you, Lord. We are called to perform works like Christ. Love Without Borders is a compassion-based ministry, formed for this purpose. But the leader of this ministry is God, not me. Surely, a feet-on-the-street leader is needed. This is me; but I remain second in command. I want it no other way. My team and I will follow behind Him to continue to do His will. I believe in this approach, we can continue forward in confidence that we will accomplish what he has set for us to do. God uses regular people every day as his hands and feet in this world. He will use anyone who is willing to say yes. You may not be used in the same way I have been. For example, most people I know will never be called to leave home for Kenya, and that is really okay. Rest assured, you can still be used to accomplish a great deal. If you want to serve alongside me in Kenya, you are most welcome. If you would like to partner with us in other ways, I simply ask you to begin by committing to look just beyond the good life and find ways you can help. If you believe in the work we are doing, one easy way to help if you’re able is financial support. There continues to be more orphans to feed and care for and broken, despairing women to help. Also, my team and loved ones will really let me have it if I don’t also share that in order for me to continue to serve and give my life as a ransom as a missionary on the front lines in Kenya, I also need support. If you do support us financially, I assure you we demonstrate full accountability and solid results, as reflected above, for your investment. Another way you can easily help is to share about what we are doing. Networking is essential and it is how we have already received much of our support. I’ll be blogging in Kenya. If you want to follow along on this next leg of the journey, just “follow” my blog and you will be notified when I post updates. If you are on Social Media, we can be found on Facebook @ LWB: Upendo Home and Instagram at LWB_Upendo_Home. PayPal donations can be sent to LoveWithoutBordersCA@gmail.com by clicking here (PayPal account not required). We value your trust and we cannot do this alone. Thank you ever so much.